When I go for a walk in the forest alone, I'm often caught up by the sound of the wind blowing thru the leaves or needles of the pines. I am reminded of a curious statement Jesus made about knowing where the Spirit is moving by seeing His activity much like seeing the effect of the wind on the trees. Throw in a good dose of fall color in this forest, and I might even break out singing a tune of praise! I can imagine my artistic heart might even dance a jig if I stumbled onto the scene of Autumn Chapel on my stroll. The combination of color and form, sounds and smells, and the draw of the Spirit might just overwhelm me. My heart so longs to be a part of what is really important in the unseen world. More than anything - painting better, making more money, or anything else - I deeply desire to be a part of what God is doing. 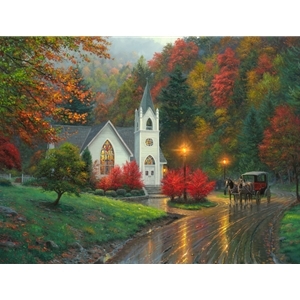 My desire to portray beautiful chapels in the four seasons is not because I love "church," but rather because of the imagery they represent. I don't mistake the building as "the important thing" but more as a work of art by a creative architect who wanted folks who enter to be caught up in something larger than their own life. The world of the Spirit - that inner you that can be connected permanently to the Holy One - is the world I want to be caught up in. It's a world so much bigger than Mark Keathley. It's a world where God moves and directs the souls of those who love him to the heart and soul of those who desperately seek Him out of desperate need. When my spirit connects with a hungry and desperate soul of another, when the message of the love of God and His total forgiveness and acceptance are spoken, and when a life is changed because they realize they are loved by HIM, the "wind" in the trees is seen and heard! The tree limbs bend and bow in reverence to the Spirit's moving, and the true Church becomes a glorious place.